Roll the top down, then buckle it shut — the procedure is common practice for anyone involved in kayaking or whitewater rafting. Not so much bikers. But this year Chrome Industries took a cue from the water sports world with a collection of bags equipped with roll-top closures. Granted, this is not the first roll-top bike bag line. But Chrome’s take is sleek and performance-oriented, not simply an adapted dry sack with straps. Called the Knurled Welded line, they are constructed with heavy-duty poly/nylon and made for bike touring or foul-weather city commuting. The line name, Knurled Welded, comes from a manufacturing process visible at the seams. The two sides of the material are knurled or dimpled to fuse together. Next, the material is welded with a radio-frequency process to create a permanent seal. The result is a 100 percent waterproof bag. Perhaps don’t go swimming with it, as water might seep through if the top is not rolled tight enough. But in any kind of terrestrial weather your goods are safe inside. 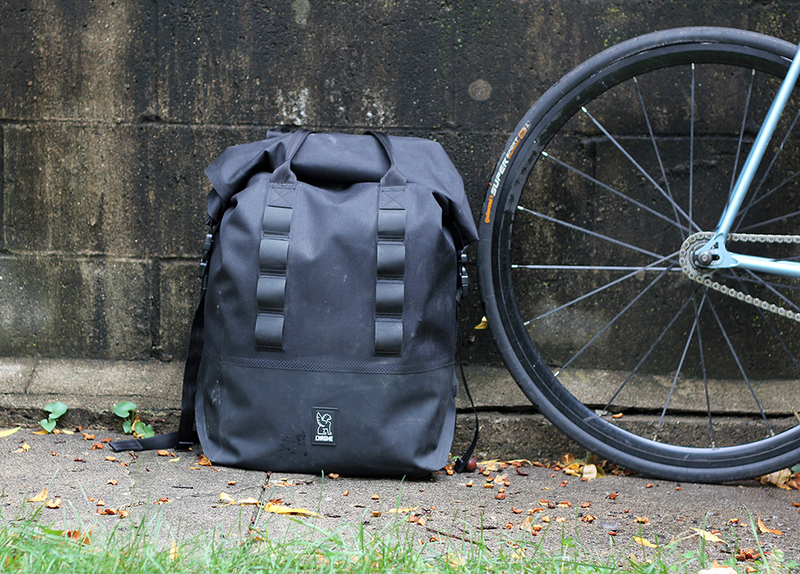 Over a couple months, I biked with the Excursion Rolltop model, a backpack in the line that has 37 liters of capacity. It’s a simple design with no zippers, no hip belt, and a large gaping top made to let you easily pack in the gear. Inside is an attached laptop sleeve as well as a small open pocket to stash a phone or wallet. There’s a foam back panel for comfort and support, but no frame. A strap buckles across the sternum for support. Chrome includes a military touch with daisy-chained MOLLE (modular lightweight load-carrying equipment) webbing on the back of the pack. You can attach items to this like a bike U-lock or also connect MOLLE-compatible accessories made to snap into the webbing loops. 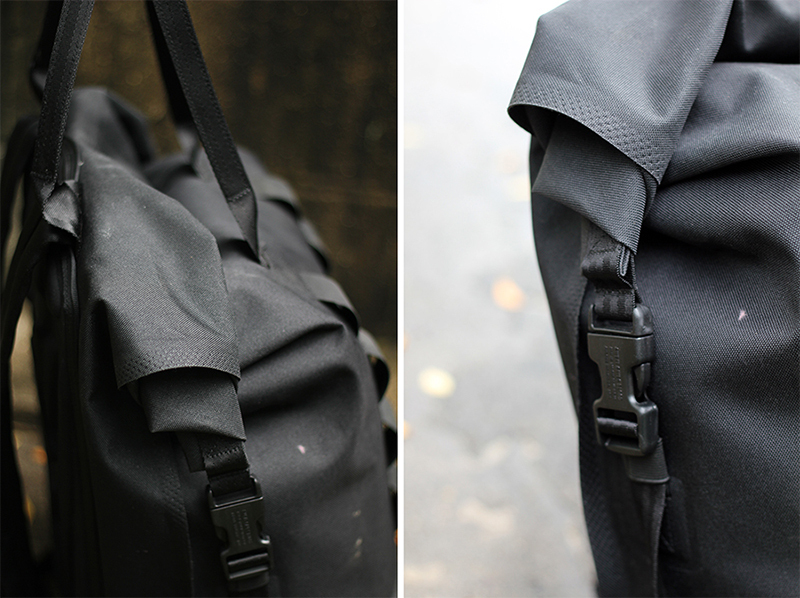 Overall, I like the performance and the simplicity of the Excursion Rolltop’s design. But the pack is not made for quick access — there are no fast-opening pockets on the outside, and to get at any gear you need to undo two buckles and unroll the top to reach inside. Not a biggie on long commutes or bike tours where you don’t need to touch your gear while riding. But for errands and workaday tasks in the city I often want a pack that opens and closes a little quicker. At $160, the Chrome bag might look pricey for such a simple design. The company offers a lifetime guarantee, however, and as a longtime user of Chrome goods I know the products are made to last. 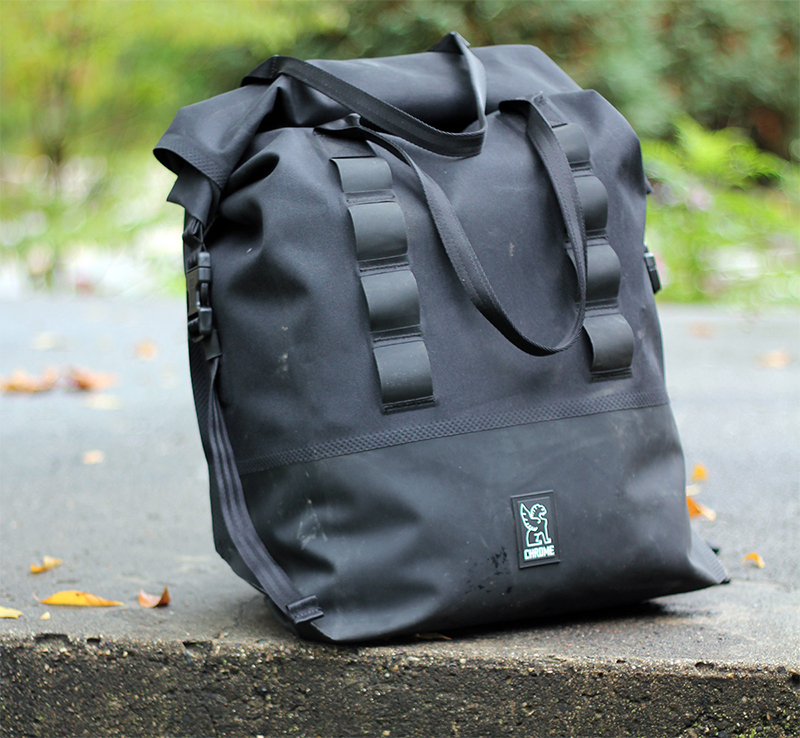 For a large-capacity waterproof bag the Excursion Rolltop is lightweight, and it’s comfortable enough to wear for a full day on the bike. Let the rain pound when you ride, and rolled shut not a drop will get inside.